We like this idea book on exterior shutters. The author is writing about using shutters to increase curb appeal. Some good pics too. 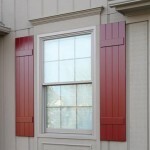 The Door Store and Windows sells and installs exterior shutters. More ideas in our idea showroom. Visit us at 4625 Shelbyville Road, Louisville. And if you are a Houzz.com fan, please follow our boards there. Kitchen ideas, bathroom ideas, and more ideas for your living spaces, lighting and landscapedesign.